The last time I made ravioli from scratch was last year in Ravioli with “orange” Stuffing – two ways, it was great and a little unconventional as I deep fried half of them and then use marinara sauce for dipping. This time, I wanted to make ravioli the conventional way. With a pasta machine, making your own pasta should be a breeze. I made my own using 1 cup of flour with 2 eggs, 1/2 tsp of salt and 2 tbsp of water, knead for 10 minutes until firm and smooth and lay the dough to rest for at least 30 minutes before using. If you wonder why there are green specks on my dough, it’s because I’ve included some fresh herbs in between the rolling process. 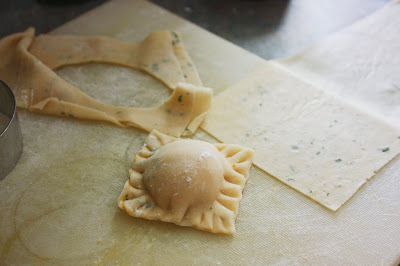 I used sage and basil because both plants needed a trim 😛 I made square raviolis initially (hence the picture) but when I realized that I had a round cookie cutter somewhere in my pantry, I made it round instead. They are so much prettier that way. 1. Season your butternut squash in a bowl with some salt, pepper and enough olive oil to coat. 2. Place your butternut squash and the 4 cloves of garlic on a baking tray and bake in the oven for 35minutes. 3. Let them cool for 15 minutes when they are done. 4. Transfer the squash into the food processor, squeeze garlic out of their peels, add your egg, Parmesan in and blitz until you get a smooth paste. Transfer the filling out into a bowl and mix in your minced carrots. Mix well. 5. Set aside, covered, until ready to use. Prepare a big pot filled with water and bring it boil. Don’t forget to salt that water – a lot. Also, prepare a big bowl of icy cold water to cool your raviolis down. 2. Spread the ravioli skin on the counter and put 1 teaspoonful of the filling on the dough. Make at least 2 inches of space in between each filling. Wet the spaces in between each filling with some water or with an eggwash. 3. Roll out the other dough and cover above the filling. With your fingers, seal around each mound to make sure there is no air caught in between the dough and the filling. Once it is secure, use a knife or use a cookie cutter like me, cut out individual raviolis, press on the edges with a fork and place them on a plate while you repeat the same process until all the dough is used up. You will make approximately 18 raviolis with this recipe, depending on the size of each raviolis. 4. Cook the ravioli until they float up and very quickly transfer them to the ice bath. 5. Time to prepare your buerre noisette. 1. Add butter into a pan. Let it simmer until it simmers no more, which means the liquids in the butter has evaporated. You will have a nice oil which will brown slightly and has a wonderful nutty taste and aroma – your butter has become buerre noisette. 2. 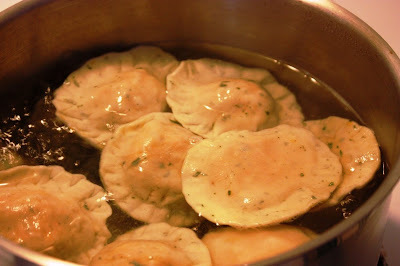 Quickly toss your ravioli (well drained), into the buerre noisette to coat and to warm the raviolis up again. This should take about 5 minutes. Once that is done, you are ready to serve. Mine is served on a bed of wilted garlicky spinach and a sprinkle of toasted buttersquash seeds. Looks gorgeous! I love the green specks in the ravioli and I love the filling! Just wondering: how thin do you roll out the dough? We just made ravioli too and I’m not sure if our dough was rolled out too thin. Tigerfish: But it is not hard 😀 Yea…there shouldn’t the yellow stuff on the poutine that looks like kraft cheese O_O. eatingclub: Thsnks! 🙂 I rolled mine dough out as thin as i could – it should be approximately 1/8 of an inch thick. I like the addition of fresh herbs to the dough. Do you think parsley would go well in this recipe? 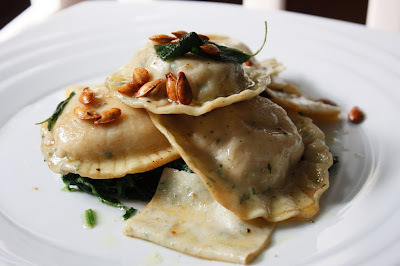 I’m an experienced ravioli maker – man I love this recipe – its a keeper – fantastic taste. Wasn’t hard to make. 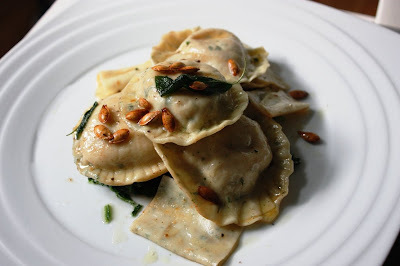 Originally I was just looking for a way to make ravioli with less fat (no meat, no overwhelming ricotta cheese). But it tastes really great! Thanks for allowing me to continue to enjoy raviolis while helping me keep on my Weight Watchers program. Made this last night, it was excellent. One thing I did different, when I tasted the filling after removing form the food processor, it was a little bland for my taste. I wanted a more concentrated squash flavor. I also noticed it was a bit to “mushy”. So I spread it into a thin layer on a cookie sheet and put it back in the 350 degree oven. After about 20 minutes (with a few mix it up, put it back in) it was the the perfect consistency and the flavor were really concentrated. I also added some fresh grated nutmeg.